There was one small side trip turn you on we had to do on the way to Big Bad Con, although it was really way out of our way, because the convention was by the Oakland airport and Chez Panisse exists in Berkeley. I made the reservations for the café upstairs exactly one month before. They don't open up reservations until then, and last year we were unable to get reservations because we started too late. I made sure that this year. I also got an interesting surprise on the way there. I managed to get over my buyer's remorse over the dress by realizing that since it was on sale I couldn't return it but more importantly that our lunch at Chez Panisse was the perfect opportunity for wearing it. I brought the coat and shoes to go with a pinstripe pant and a more formal shirt, but they worked quite well with this dress. The whole experience also allowed me to get over my girl inadequacy issues one more time. Sometimes I think that's a never ending battle, but I do realize I come to heads with it less often now than I used to. 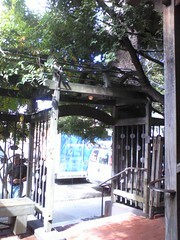 The next surprise was that the Imperial Tea Court was right next door to Chez Panisse. North Berkeley is beautiful, quiet, and has a lot of very impressive shops right next to each other, and this small tea shop was one of half a dozen eateries in what looked like a common strip mall. But the quality of everything in that place made me regret not living here. I have a very long history with the Imperial Tea Court, going back to my Seattle days. I bought quite a lot of my Yixing clayware, which I use in my gung-fu brewing, and a great deal of my tea and glassware from them. For about a decade they were the only ones importing specialty teas directly from China. It was a little bit like stumbling upon a legend, for me. I'd only ever used the online ordering service, and hadn't ever thought I'd see one of their stores. I dashed in just to see if it was real, but we didn't really have the time for me to explore. Our reservations for the café were at 11:30 AM, the first possible slot it turned out. We wanted an early lunch to make commute back to Oakland easy. We arrived before the place even opened and sat out in the front courtyard for a few minutes. I have to say that I really love planning things with Carl, because we always put plenty of time in front of everything so that we never have to stress about getting where we need to be. We were the second party seated in the café. It did amuse me that the party in front of us made the reservations only thirty minutes ago, but I didn't feel guilty for making my reservation a month in advance. I still wanted the experience enough that it was well worthwhile. It was really fun having lunch with Carl, because we both let each other taste each others dishes. And then he surprised me by telling me that the lunch was my birthday treat! I thanked him thoroughly. Carl had a few things to catch up on after lunch, so I had some time to go to the Imperial Tea Court and shop. I found myself far more reluctant to buy more tea, because Flit had given me half a dozen amazing teas the day before. I was unable, however, to pass by the opportunity to buy more Phoenix Jasmine Pearls. A single ounce costs just about what I can bear to pay, but when I add shipping costs it never works. In this case I didn't have to worry about shipping, and a single ounce of this particular tea can last me quite a while. Since this tea shop was also a café and restaurant, they also had bottled drinks in a refrigerated case. One was a beautiful ginger beer with particles of grated ginger still in it. I bought two bottles of that for Carl and I, and we placed it carefully in his trunk. It's always good to have drinks at a convention. From there we headed to the Oakland airport, since Big Bad Con was being held in the Hilton Airport Hotel. I have to admit to being in love with the fact that a gaming con has the full map of the place. We were in building five, with the entire ground floor held for games, and everyone's rooms above. I liked how that worked, as it was all self-contained. Throughout the year Carl invites me to various conventions all over the West Coast. There have been conventions in Seattle, Portland, and the Bay Area. I get to see Southern California often enough on my own, and I often contemplate going to different gatherings. I usually do the MiniCon at EndGame in Oakland, where they do a single weekend's worth of games. This time, however, I decided to do Big Bad Con mostly because Carl was running at it and was very enthusiastic about it, but another good selling point was that it was using the same kind of registration system that the MiniCons used, i.e. one signs up for the convention in advance and there is a day and time when one signs up for all the games one wants. It makes it so you can find out immediately whether or not you've gotten into a game you want. Then you can look for other games, or figure out what you really want filled out in your schedule. I really love that system, especially compared to the one DunDraCon uses, where you don't find out if you're in a game or not until minutes before the game itself. It makes scheduling impossible, and I never got into more than one game I really wanted at DunDraCon. At Big Bad Con I got into two games I absolutely had to have and really enjoyed the other three that I got into. I was able to know exactly what I was going to be playing and what time I wasn't. Next year, if I do this again, I'll probably leave one slot open for Games OnDemand, just to get that pickup game feeling again. It did take a while to check in as the hotel wasn't able to get rooms ready under 3, and we were pretty thankful we didn't have 2pm game times. Instead, we were able to just hang around with lots of different people, check in when the rooms were open, and I had a nap before waking up in time for dinner. Carl and I met in the restaurant, which was entirely empty and just open, and sat near the back to have a little distance from the noisy bar. By this time I was kind of fed up with travel food, so I just ordered a Cobb salad and ate what I wanted of it and it was really nice. Carl got exactly the same thing, and seemed quite satisfied as well. My Friday night game was a late night Monsterhearts game with Carl. It's a system that he's supported vigorously with play through a number of conventions, and Joe McDaldno, the creator of this variation of Apocolpyse World was at the convention, visiting with people, talking, and signing books. It was really cool to meet him. Carl loves independently published gaming systems and he has a really amazing collection of links about the various games systems he'd championed in the past right here on this list. Monsterhearts is a game about supernatural teenagers in high school situations. It makes it easy to model stories like Buffy the Vampire Slayer or Twilight. It's based on the Apocalypse World mechanics, and character creation involves a starting 'skin'. As part of the skin, one has to define relationships with all the other characters in play. Usually these involve a mechanic called "strings", which can be used to influence or get things from other players. The lovely thing is that Carl asks for a character motivation and/or actions in order for each player to create these "strings". Carl is masterful at the art of asking the right question at the right time, and when his players blurt out something from the top of their head, he takes it, enhances it, and often gives it some sort of unforgettable phrasing. It's this "AhHA! He GETS it!" moment when he captures what they meant to say, and gives it exactly that grace note the shared story required. Carl's also really good about just letting go of whatever plot he's prepared if the players are getting the bit between their teeth and taking the story in the direction they want to go. He's really great about making choices matter, and giving appropriate consequences. I'm also going to say up front that this particular write up contains far more metadata than I usually get with a game writeup. I usually just jump into my characters POV and write the storyline from their perspective. Monsterhearts games far more difficult for me to write up, partially because it isn't neatly linear. The plot rambles depending on who is interested in what, and the relationship web is complex, gets established in part during the character creation, and grows by leaps and bounds at the beginning of play. It's great for those that want a solid basis for a character to start, and only adds more onto that base. The mechanics make it so that the story getting created between the characters happens even before the characters are fully created! I kind of like that, as it starts them off with this gorgeously complex, living web of relationships to start. It makes for a very intense experience during play. The collaborative storytelling aspects are emphasized, and it really does become four people making a story together, with Carl trying to keep all the threads rolling. And since Carl likes the kinds of games that emphasis player/character choices best, this system is very much suited to his running style. Vanessa played Delilah the Witch, Sam had Daniel the Ghost, Bryant (yay!) created Walter the Fae, and I had Cassidy the ambiguous-to-start Werewolf. Delilah started right in by saying that she tried to raise Daniel, but was sure she'd failed. It didn't work the way she thought it would, but she kept a lock of his hair after. She'd also stolen a piece of Walter's coat, and she'd been going through the stuff in Lee's locker when I'd caught her, but hadn't said anything. Lee was my one and only friend, as I was the new girl (at this point everyone thanked me for fulfilling the title of the game. XD ). Walter took his coat and decided that it was from his long-gone parents, the last memento he'd had from them before they'd disappeared. He now lives with his neglectful and resentful Aunt and Uncle from his father's side. He just woke up one morning and the coat was draped across his bed. His by-line was "People know how I feel", and he is obviously sad and angry. He writes poetry for all the girls in the school but one, and has a dream journal. I was Cassidy, the new girl at school, I moved in over the summer, and I'm a brand new werewolf who just started changing a moon ago. I'm also the one girl that Walter does not write poetry to. Daniel jumped in at this point and decided he'd died 20 years ago, and there was this huge scandal and he attempted suicide as a cry for help but messed up and actually died and resented that. He was a Goth and did cutting. Delilah now lives in his house, has his bedroom, and he died a Junior. He's going to go to school in the same junior class. No one notices. They all lived in a small, isolated town out in the woods in Oregon. A small town that used to thrive on timber and has fallen on hard times. Cassidy's parents were successful people from the Big City, and arrived with bags of money, which they used to buy an enormous mansion that had been foreclosed on. The mansion, of course, belonged to the wider family that Walter now belongs to, and while it wasn't his aunt or uncle that lost the house, it was a house that Walter's Family used to own. All of that was before we even started playing! See what I mean about intricate webs? I love this kind of way to define the characters even before the push of them all having to go to the first day of school. So on the Tuesday after Labor Day, everyone is having to make their way to school. Walter got there early, partially because he was just that way, but also because he knew a lot of people at the high school and wanted to get in early to scope everyone out as they were coming in. He was on the basketball team, for all that he was short, he was fast, agile, and could really shoot, and during the summer he'd beaten Russell, a kid that was taller than him, out of a starting spot on the basketball team. The third reason was that he had been living in the abandoned house before Cassidy and her parents had moved in, but he figured it was wiser, for the first day of school to be home and get ready from home. He actually cleaned up, slept in a bed, and got ready from his Uncle and Aunt's. In his big coat, Walter perched on the front steps, watching people come in. Delilah was early, dressed in her usual librarian style, conservative glasses, skirts and tights, and a suit coat. She'd lived in this town her whole life, and Russel, for all that he was her cousin, annoyed her immensely. She was into books, but not into her homework, though it got done. She has both parents and lives with them. Cassidy walked into school with Lee, the friend she'd found during the summer. Cassidy had been running around as a gang-girl in the city while her parents were making their money, and she had twin siblings who were freshman, Wyatt and Sarah, the product of her parents' second try for kids in vitro. But as the new girl in town, Lee, being the 'tough girl' in town had challenged Cassidy and got whipped by Cassidy. After the fight they became fast friends as they both understood where the other was coming from, and so went into school together. On the steps, Walter said hello to everyone but Cassidy, and she wondered what was wrong with the boy in the big coat. I think part of the fun of the game itself is this cascade of details, but it makes for a ton of details that gets dropped later due to how things play out. A few key items get picked up again, so it's hard to sort through it as to what's important and what's not until it's done and writing it up as it happens doesn't work quite as well as knowing what happens after and only writing that up; however, that loses all the flavor of the play. It reminds me of TV episodic methodology, where huge chunks of the past suddenly come up at the 'appropriate moment'. Seating arraignments became a bit of a shuffle game, the class wasn't that bit, with the addition of Keith, the dedicated class nerd who did all of Delilah's homework for her. Stephanie and Russel were in the class as well. Stephanie was lead girl of the class. Her brother Jason was the star of the basketball team, but he was a senior. Stephanie as going to have a birthday party on Saturday, the same night as the next full moon, and there was some jockeying for invitations. Poor Russell was the brunt of a lot of abuse, including getting tripped by Lee, and when he started to sit down in a seat in the back row, Walter told him, "The back seats are for starters." Which Sooooos should have been used later in the game, and deserves to be recorded simply for posterity's sake. Much of the rest was just a jangle of high schooler's doing what high schooler's do with extra pushes toward the forbidden on all fronts as the darker powers of several of the characters depended on being able to push social norms. Part of the beauty of the game lies in the fact that high schoolers are awkward, aren't able to come up with the best lines, so the players don't have to always try to do the thing that's as awesome their characters and get hung up on the 'what's smartest versus what's most spontaneous' problem, but, rather, the first thing that comes off the top of their heads. Daniel, in particular, got more power every time someone confessed something to him, and Delilah got something every time she did something taboo, so both of those became reflexes. So we get things like Delilah seducing her coursin Russell and Daniel getting Russell to confess it to him, and then Walter walking in on the confession and aftermath and all three boys getting into a fight. Stephanie gets Delilah to buy the booze for the party, satisfying both of them. The mildly bleeding Daniel gets hauled away to the first aid station by Miss Woodrow, who happened to have a crush on him twenty years ago. Delilah invites Russell over for seconds at 11 that night, and does a spell to see through the eyes of whatever's been going bump in the night, and sees herself through Daniel's eyes. Daniel's in the closet, still haunting his Dad's old house. Cassidy finds Walter in the attic that night. She corners him and finally makes him confess as to why he's never written her a poem, of all the girls in the school. "Why won't you reach for what you want?" "Because I don't deserve it." Walter makes her promise him that they'll never do this again so long as money is between them, and they enjoy the one night together. Meanwhile, Delilah freaks the hell out, kicks Russell out, and Daniel follows him and threatens Russell with blackmail about sleeping with his cousin. Russell tries to kill him, but Daniel's already a ghost and he sees that he can pretty much get Russell to do anything he wants. Delilah chases after them, gets in between, and he asks her why she did what she did. She answers that she just wanted to see what she could do. Daniel nods, realizing it's an invitation, and turns Delilah's house into a House of Spooks, an utter ghost house, with Daniel as the gateway. It was a perfect ending to the game, and right on the end of the four hour time slot, right at midnight. The hallways still had all kinds of people in them, and we just sat out at a table in the hallway and said hello to everyone that passed by. It was a wonderful way to converse about games with a lot of people who were very very knowledgeable about what as out there. Carl follows these things with a passion, and I'm happy to just bob about in his wake and let him do all the exploring and just jump in here and there. One lovely thing that happened was that Joe and Jackson, Joe's partner, came up in the midst of it all to present Carl with all the things they owned him for him backing the Monsterhearts Kickstarter. It was a lovely presentation, and there were utterly gorgeous hand-made and lettered zines of various aspects of the character types from Monsterhearts. It was really cool to see Carl get the prizes and really treasure them. We then had a crowd of about a dozen in the hallway and got into lovely lovely conversations. By 2 am, though, I was wilting with my hour-off metabolism. I went to sleep then, happy that my room was just in the same building so I could just tell Carl and all his friends good night, and wander off. Wow. 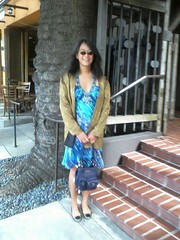 I remember Chez Panisse from when I was at UC Berkeley, back in, well.., it was a really long time ago. It's great to hear that they're still serving such fascinating meals. They are!! They are. It was utterly lovely, too!! Thank you! *blush* You were entirely correct.